As you can see from the examples below, no lab "certificate" can protect you from purchasing a poor quality diamond. Take the time to personally examine the diamonds you're considering. Ask questions so you understand exactly what you're buying. Deal with an honest, ethical jeweler. Be sure to find the high quality diamond that matches that special someone you're buying it for. The lab "certificate" below shows a GIA clarity grade of VS-2, but the inclusion you see on the plot is a black carbon spot clearly visible to the naked eye. This inclusion is almost dead-center in the table, and will be seen by the wearer every time she looks at her ring. The buyer of a VS-2 diamond should see nothing like this. This "certified" diamond is overgraded, and would never make it into our showcase. No C.W. Smith Jewelers customer will ever wear a diamond like this. Our strict and conservative grading will eliminate these overgraded diamonds, regardless of what the "certificate" says. The diamond pictured below (not related to the certificate above) was "certified" as SI-1 by EGL and VS-2 by GIA. Again, the "certificates" look fantastic, but the inclusions you see were clearly visible to the naked eye as soon as we opened the diamond paper. 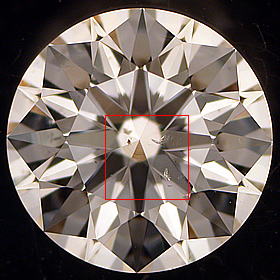 Any diamond graded VS-2 or SI-1 should NEVER have visible inclusions. This is another example of why you should never buy any diamond without seeing it first and understanding exactly what you're buying.